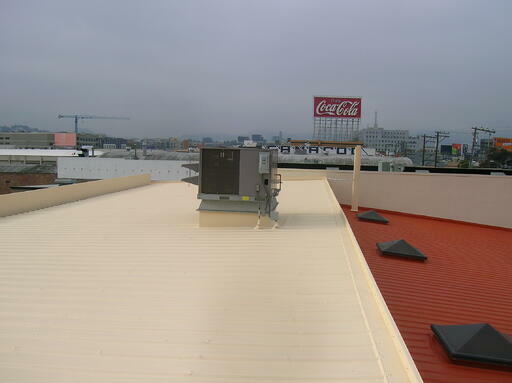 A Metal Roof Case Study - Hundley Hardware Co.
E.M. Hundley Hardware Company's building was an aging metal roof system, over twenty years old, that was revealing inconsistent nuisance leaks to the interior sales floor. 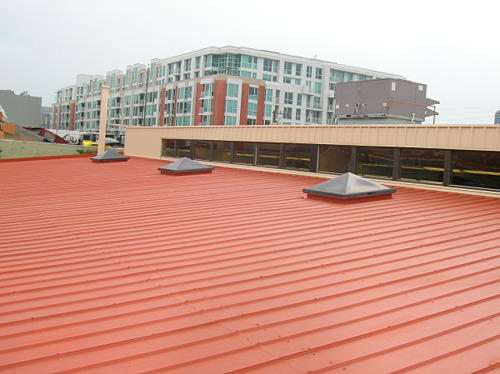 IRC specified a National Coatings' AcryShield Roof Restoration System consisting of a localized, reinforced, two-coat, 100% acrylic elastomeric custom color coating system with polyester fabric reinforcement at all metal panel end joints. "National Coatings makes this approach feasible not only with excellent coating products but also with the wide range of accessory products from rust-inhibitive primers to individual butyl caps to encapsulate the existing panel fasterners." Looking for a Metal Roof Sealer to Achieve Excellent Waterproofing? Whether you are installing a brand new metal roof or restoring an aged one, you will need to establish adequate protection against water penetration. Metal roofs are installed by attaching individual panels to one another. These panels are snapped together and fastened to the roof deck with rubber grommets. 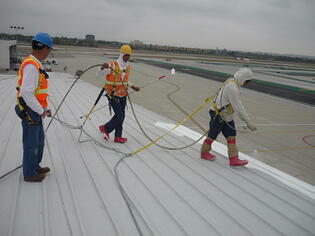 For a newly constructed metal roof, a metal roof sealer is required. Typically butyl seam tape is positioned over the joints and seams between the metal panels and butyl caps are placed over all nails and fasteners to ensure proper sealant. In the case of a metal roof restoration job, the seams, joints, fasteners and nails are the areas that are most prone to degradation allowing for water penetration. These areas need to be thoroughly re-sealed with a new metal roof sealer – butyl tape, butyl caps, and AcryFlex for detail areas that are unable to be sealed with either the butyl tape or caps. 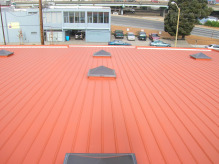 Once the metal roof sealers have been installed and all rust has been either removed or primed with a rust-inhibitive primer, such as RustShield, a base coat is applied with the option to embed custom reinforced polyester fabric in areas needing extra strength and durability. Lastly, a topcoat is applied over the metal roof surface leaving you with a fully restored, UV protected, watertight roof membrane. Butyl tape is a 4-inch wide, high tensile strength, polyester-reinforced, butyl rubber sealant tape for sealing edges and seams on metal roof panels. Butyl caps are round disks consisting of a tenaciously adhering butyl rubber sealant topped with a reinforcing polyester surface. AcryFlex is a premium quality, water-based, elastomeric, acrylic sealant engineered for long-term flexibility, adhesion and weather resistance. 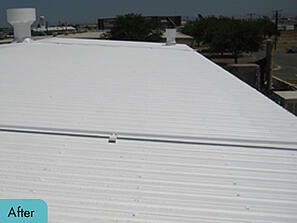 AcryFlex is excellent for application on metal roofing and sealing around joints and flashings. 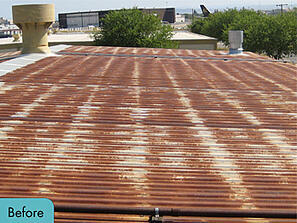 Metal roofs respond extremely well to roof restoration installations. The metal roofs are initially installed by snapping sections of metal panels together, which are then fastened down with rubber grommet screws and finally all the seams are sealed with a sealant to create a watertight metal roof. Eventually, these seams wear down and begin to fail, leading to water penetrating the newly exposed seam, initiating the development of rust. When restoring a metal roof that has been exposed to these conditions, National Coatings removes the rusted areas and uses a high performance rust inhibitive primer to protect the roof from any future rust growth. 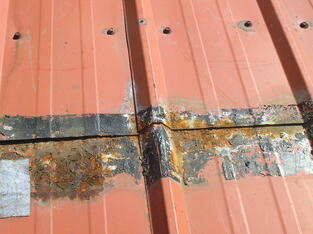 Then the roof is sealed and waterproofed with a butyl tape metal roof product to ensure a watertight building. This tape is 4-inches in width to provide complete coverage of all necessary seams on both edges of the panels. It has extremely high tensile strength, allowing the tape to stretch and expanding with the building, without breaking, ripping or tearing. The butyl tape used by NCC is polyester-reinforced for durability and consists of butyl rubber sealant for excellent sealing capabilities on edges and seams of metal roof panels. After the butyl tape is installed, a topcoat of roof coating is sprayed over the entire metal roof, covering the butyl tape. 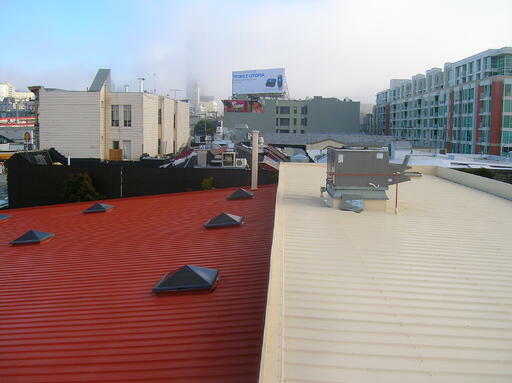 The building owner is left with a brand new, fully restored metal roof that has excellent waterproofing capabilities, reflectivity, strength and durability. This roof can be renewed in the future to prolong or avoid a roof tear-off indefinitely, saving the building owner a lot of time and money. For more information on restoring your aged, failing, rusting or leaking metal roof membrane, download our Free Metal Roof Brochure or contact one of our Roofing Professionals.